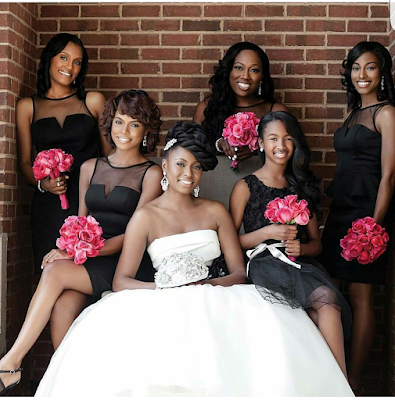 Hey!Laura: would you let your bridesmaid wear black on your wedding day? would you let your bridesmaid wear black on your wedding day? Was arguing yesterday about this topic. I'm a very liberal person, I think fashion and style is defined and seen in different ways. This to me isn't a bad look, I won't let my bridesmaid wear it though but it isn't bad. What do you guys think? Got to rock it or make it stop? Why not. It's not the color that should be the problem. It's how they wear it. Never say never. Fashion is evolving. Judith on point soooo true!! Pls, black never looked better! Its cool for a photoshoot...but for my big day, its a Nooooooooo! I honestly doesn't see anything wrong wt my BMs wearing black...black is an elegant colour.that's my take.